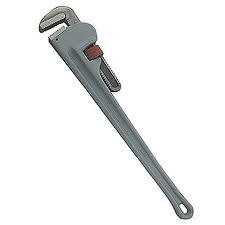 The pipe wrench is an adjustable wrench/spanner used for turning soft iron pipes and fittings with a rounded surface. The design of the adjustable jaw allows it to lock in the frame, such that any forward pressure on the handle tends to pull the jaws tighter together. * Please call us for any questions on our pipe wrench 2ft rentals in Kokomo IN, Logansport, and Central Indiana.